Cooking Demo and 30-Day Raw Challenge! Life is moving in the perfect direction for me and I have some exciting news to share! 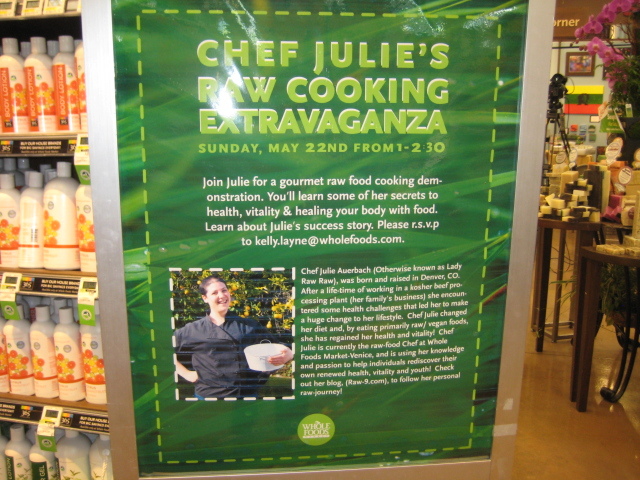 I will be leading a cooking demonstration at Whole Foods Market-Venice (225 Lincoln Blvd) on May 22, 2011 from 1:00-2:30 PM. This event is free and I would love to see you there! Please tell you friends and family or anyone you think might enjoy a cooking demo! Next – while I hope you enjoy reading about my raw transformation, I would like to hear your experiences! I am going to be hosting a 30-Day Raw Challenge beginning June 1st! I challenge you to take charge of your health, for the month of June! If you are interested in learning more, click on the 30-Day Raw Challenge Page at the top of this blog! I look forward to transforming with you! Finally, I posted a couple raw recipes on my “Raw-Veggie Recipe” page. Check them out, and indulge yourself with some living energy! Please comment on the recipes if you have any questions, comments, or anything else you want! Your little miss helper here. Love the idea of this raw journal we can actually communicate and not only once a week. Hope all is well and hope Gold’s Gym is going well. Keep smiling at everyone and eventually they will smile back. Don’t wait for people to be friendly show them how. Anyways, I went to the Ellen show with my family today and Ellen is vegan. We should email her and ask if we can make raw vegan food for her. haha Well, hope all is well and see you at the Raw Bar. Thanks for commenting! You’re rawesome 🙂 I took your advice and opened my heart a little extra today and it’s been awesome. Strangers are smiling all over the place 🙂 Re: Ellen – fantastic idea, I’m working on it! Re: ice cream – I actually made some to test out yesterday! I’m about to go try it, and there will be some for you to try tomorrow! Yay!